Xilinx Zynq UltraScale+ Arm Cortex A53 + FPGA MPSoCs were announced in 2015, with actual products launched in early 2017 such as AXIOM development board or Trenz Electronic TE0808 UltraSOM+ system-on-module which are based on the ZU9EG model, and cost several thousand dollars. Recently, I wrote about Mycroft Mark II smart speaker based on a “quad core Xilinx processor”, and initially I assumed it was an Zynq UltraScale+ MPSoCs since those are the only Xilinx “quad core processors” I know of, but now I think it must be an unannounced part, since the company can’t provide the exact part number, and the price would be too low. Nevertheless, this lead me to check out if there was any lower cost boards based Xilinx Zynq UltraScale+ MPSoC with four Arm Cortex A53 cores, and ZU2EG is the entry-level part that matches this description. I could not find a ZU2EG development board, but ZedBoard community, which previously launched platforms such as MicroZed and MiniZed, lists UltraZed-EG system-on-module powered by Zynq UltraScale+ ZU3EG MPSoC, as well as a starter kit with a carrier board. 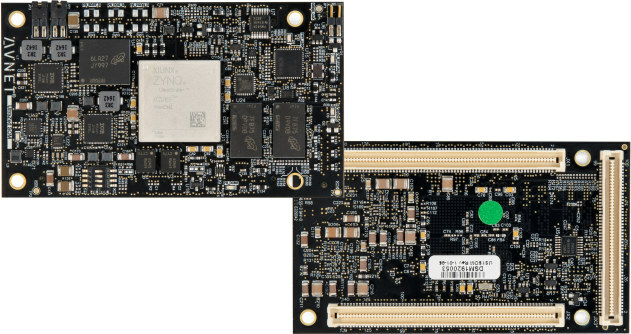 A Linux BSP and a hardware reference design are available for the module, as well as documentation on the product page. Two version of the module are available AES-ZU3EG-1-SOM-G with extended temperature range for $485, and AES-ZU3EG-1-SOM-I-G with industrial temperature range for $535. The specifications also indicate that XCZU3EG-1SFVA625 MPSoC is pin-to-pin compatible with with the ZU2EG, ZU2CG, and ZU3CG MPSoC devices in the same package, so maybe lower-end (and cheaper) versions of the module will be offered later one. The kit also includes a 12V AC/DC power supply, a Quick Getting Started Card, a microUSB Cable, an UltraZed-EG SOM Mounting Hardware, an 8GB microSD Card, and an RJ45 Cable for Ethernet. Software-wide you’ll find a voucher for Vivado Design Edition with ES1 License (device locked to the ZU3EG) for SOMs with ES1 silicon, and Webpack for SOMs with production silicon in the kit. General UltraZed-EG evaluation and prototyping, test & measurement, motor control, and industrial automation are some of the potential applications for the kit. The carrier board only is sold for $499, but you’ll find the complete UltraZed-EG starter kit on AVnet for $895. Visit the starter kit page for further information. Alternatively, you’ll also find a UltraZed PCIe Carrier Card on the product page.